Chief Justice Hugh Rawlins of the Organization of East Caribbean States (OECS) Appeal Court dismissed the appeals last Monday, February 21, and upheld the convictions and sentences that Senior Magistrate Donald Browne had placed on Corporal Casankie Quow and Constables Osrick James and Hadley Ballantyne on Tuesday, February 2, 2010. 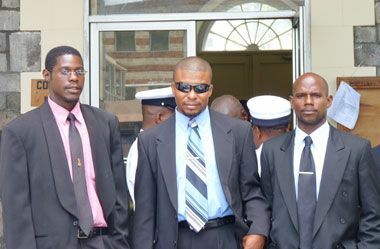 The officers, who were attached to the Criminal Investigation Department (CID), were convicted of assaulting Jemark Jackson on November 18, 2008, at the Criminal Investigations Department (CID). Jackson was 15-years-old at the time of the incident. The trio were fined $1,500 to be paid within one month. In default, each would serve six months in prison. The officers, not being satisfied, appealed. When the appeals came up in the assizes, they were heard by Chief Justice Rawlins, and Justices of Appeal Ola Mae Edwards and Janice George-Creque. Jackson was represented by Director of Public Prosecutions (DPP) Colin Williams and Lawyer Jomo Thomas, while Sir Richard Cheltenham, QC, and Stephen Williams appeared on behalf of the appellants. The teenager was arrested for being involved in a fight earlier thay day. His encounter with the police came when while sitting on a wall in the vicinity of the Dr. J.P. Eustace Memorial Secondary School, a vehicle with officers pulled up and took him into custody. He told the court that while in detention, Quow pulled his gun out and asked him and Kimron McDowall, another teenager who was taken into custody, whether they wanted him to shoot them. Jackson alleged that he was slapped by Quow and was thrown on a table by other officers, while Quow beat him with a hose on his head and back. He charged that Ballantyne and James lifted him from the table and slammed him twice onto the ground. He added that he was also kicked by James. Jackson claims that he was abused while being questioned by Corporal Barker about a case in the High Court involving a burglary at Cell Word in which Jackson had given evidence. In their evidence, the police officers testified that they did not beat Jackson. They also said that they did not see anyone beat him nor throw him to the ground. The court, however, heard that the police officers admitted to telling lies to their superiors as well as making false statements. In contrast, the evidence of Jackson, the young man who was arrested by the police, was described as consistent and âunshaken in cross examinationâ. Sir Richard Cheltenham, QC, one of the lawyers representing the convicted police officers, told the court that he needed it to resolve the time Jackson received the injuries complained of and found by the doctors. Sir Richard said this is because the vendor who gave evidence in the case had testified that the teenager was involved in fights on November 17 and 18, 2008. In his judgement, Chief Justice Rawlins contended it is obvious that Senior Magistrate Browne had resolved that Jackson had sustained the injuries while in detention at the police station. He, however, concluded a fuller analysis of the evidence towards that conclusion would have helped. Notwitstanding this factor, Chief Justice Rawlins stated: âIn my view, therefore, although the learned magistrate could have better analyzed the evidence, the appellants cannot correctly assert that they are unable to understand why the magistrate convicted them given the evidence and the reasons that the magistrate gave. âIn the premises, I would dismiss the appeals and affirm the convictions and sentences of the 3 appellantsâ, Chief Justice Rawlins ruled. Deputy Commissioner of Police Bertie Pompey when contacted on Wednesday evening said he had seen the judgement which overturned the appeals. Pompey said as a result of the convictions, the men can no longer be police officers. He said, the only reverse is to take the matter to the Privy Council and this is an expensive venture. Jackson had spent seven days in a coma at the Milton Cato Memorial Hospital and upon his recovery he reported the matter to Lawyer Jomo Thomas.